carriewriterblog: New Contest! Win a Free Copy of The Illustrated "Elements of Style"
New Contest! Win a Free Copy of The Illustrated "Elements of Style"
Just subscribe to this blog, and my carriefreelance monthly newsletter (see subscribe button on my home page), which contains arts reviews, communication tips, web site discoveries and more...by October 15, 2008, and you will be eligible to win the great book, a $15 value! What's the solution to making grammar painless? This is the perfect gift for anyone who loves writing, and wants an elegant book to serve as a reference and guide. This is the ultimate writer's reference book, with answers to questions like using the active voice vs. passive, how to use commas and parentheses, colons and semicolons, and everything you ever wanted to know about participial phrases. 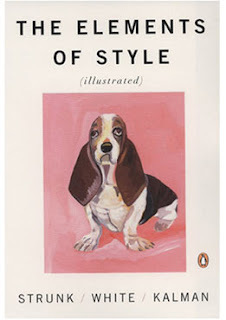 This artsy edition of the classic "The Elements of Style," by Strunk and White, features stylized, exuberant, colorful, and often whimsical illustrations by Maira Kalman. Some references have been changed to make the book more relevant. For instance, in the earlier edition, the authors cautioned against the use of acronyms with this example: "Not everyone knows that SALT means Strategic Arms Limitation Talks." The new edition states, "Not everyone knows that MADD means Mothers Against Drunk Driving." In the section on slang, Strunk and White advised writers to avoid such words as "uptight, groovy, rap, hangup, vibes, copout, and dig." In the new edition, examples of slang are "psyched, nerd, ripoff, dude, geek, and funky." Strunk and White advocated "using scissors on the manuscript, cutting it to pieces and fitting the pieces together in a better order." In the current edition, writers are encouraged to use a word processor to move text. Now to the contest....just subscribe to this blog, and my carriefreelance monthly newsletter (see subscribe button on my home page), by October 15, 2008, and you will be eligible to win the great book, a $15 value! Good luck, and may the forces of good grammar and punctuation be with you!